Veet recently launched a new 'Naturals' hair removal cream range. The new range is made from 100% natural extracts and formulated with mild and refreshing, nature inspired fragrances. It is available in two variants - with papaya extracts for normal-dry skin and with camellia seed oil extracts for sensitive skin. 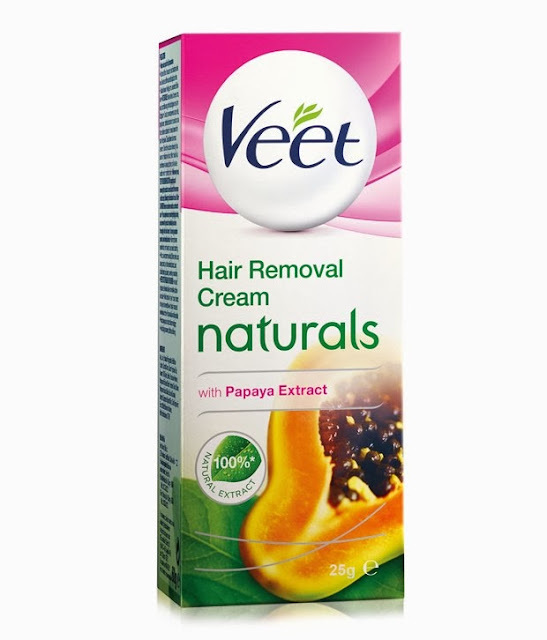 So here is my review on the Veet Naturals Hair Removal Cream with Papaya Extract. I swear by Veet products. I have always been a loyal customer and will continue to do so. The packaging of this product is quite attractive. I love the colours which are used on the packaging. I prefer tube packaging due to hygiene reasons. Besides the cream, a spatula and an instructions leaflet is also provided in the box. As you can see in the below swatch picture, the cream is pearl white in colour and spreads easily. The best part of this cream is that it smells quite good and does not have the typical hair removal cream smell. This is a big plus point as I hate such creams which smell really bad. If you are one of those who have a sensitive nose then you will definitely like this cream. This cream effectively removes all unwanted hair in around 3 minutes. I do not keep it on for more than 5 minutes. I haven't experienced any side effects. It did not irritate my skin in any way nor did I notice any skin darkening. I purchased this cream online but it is yet to hit most of the major online shopping sites. I will definitely purchase this product again. Rating: I would rate this product 4/5.